For other uses, see Fort Foster (disambiguation). 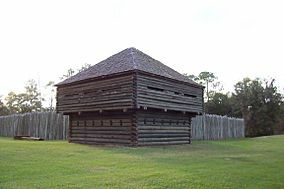 Fort Foster (now known as Fort Foster Historic Site) was a fort in central Florida, located 9 miles (5.6 km) south of current-day Zephyrhills in Pasco County. On January 1, 1837, Col. Foster boasted in a letter to Genl. R. Jones that, "the works at "Fort Foster" on the Hillsborough River. That Fort & Bridge form one of the best and strongest field fortifications ever erected against Indians." Fort Foster was a strategic fortification built for the protection of the bridge and with more importance on the supplies within. Fortified supply depots were continuously placed deeper into Seminole territory to allow the soldier to operate in the field while they captured the hostile Seminoles. Fort Foster Facts for Kids. Kiddle Encyclopedia.